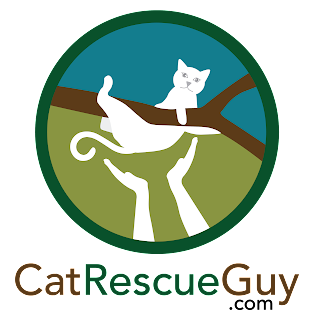 Kym works on the board for three different charities, one of which is Pet Aid, an organization that provides spay/neuter services for pets and their owners. Kym has a very nice work space at home with a large desk facing out a large window. Her one-year old cat, Seven, loves to work there with her. Seven has her own perch to the side with a commanding view over the desk and out the window, and, like many cats, she frequently likes to walk across the desk on top of the papers and computer keyboard while Kym is working on them. Kym lovingly tolerates this because she loves her kitty. 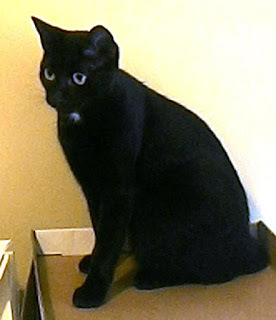 Seven came to the family just one year ago when Kym's daughter arrived home from work only to discover that a four-week old black kitten had stowed away somewhere in the car. They do not know how long the kitten had been there or where she may have first hidden in the car. Since they could not determine the kitten's origin, they kept her and gave her a very good home. When Kym asked her grandchildren what they wanted to name the kitten, they chose "Seven." There is no particular significance to the number or the name; they just liked the word "Seven." The only problem was that Kym and her husband, David, also provide a home for several dogs, but fortunately, they all quickly learned to get along just fine. In spite of the fact that Seven was small and seriously outweighed and outnumbered, she ruled the house and kept the dogs in line with swift justice to any dog that dared to violate her laws. Seven likes to go out into her spacious backyard, and occasionally, Kym allows that, but, otherwise, Seven is always indoors. 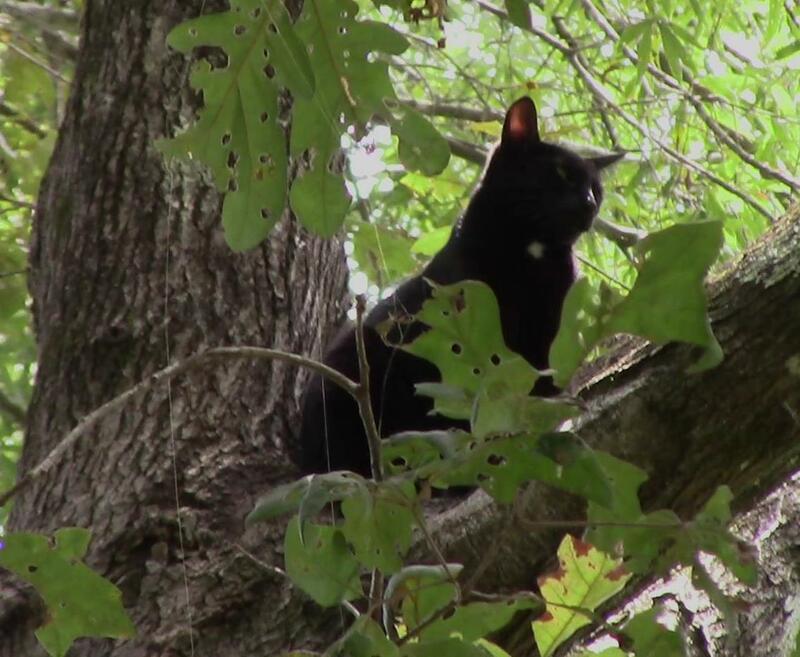 It was on one of the outings to survey her territory that Seven suddenly found herself stuck up in a tree. We aren't sure why it happened. It could be one of the dogs got too playful, or maybe another cat that lives in the area decided to assert its authority. Regardless, Seven was now stuck almost 30 feet high in the tree, and all of Kym and David's efforts to coax her down were met with failure. They worked at getting her down well past midnight before giving up. That was when Kym searched the web for some ideas and found me. We talked on the phone the next morning, and I agreed to go out there right after lunch. When I arrived, I met Kym and David, and they led me through the back yard to the tree that held Seven. 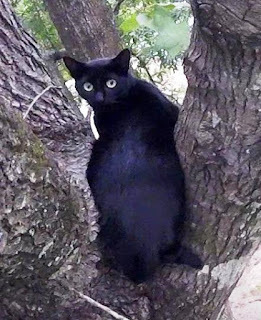 I could hear her before I could see her, but there she was -- all black except for a small white dot on her chest -- in a large crotch of the tree. She cried to us below, and Kym told me that I could expect her to be friendly with me. I picked out the only suitable limb above Seven that would hold my weight and began to set my line there. While this crotch was about 15 feet above her, the path of the rope to the ground passed very close to her, and this movement, noise and closeness made her a bit nervous. Kym came to the rescue, however, by talking to her in the most perfect, calm and relaxing voice. Seven was clearly soothed by her voice, and even I found it soothing. I encouraged Kym to continue talking to her while I set up. Seven moved to another crotch on the other side of the tree, but was settling down very nicely there facing Kym but with her back to me. As I began to climb up to Seven, I wanted her to see me approaching to avoid any risk of startling her, but Seven continued to keep her back to me, and the talking and noises I made did not cause her to look behind in my direction. I asked Kym to move to my side of the tree to see if Seven would turn around to follow her, but Seven continued to stay where she was. In spite of my efforts, I could not get her to turn around. Maybe the crotch was too tight of a space for her comfort, but whatever the reason, I had to climb all the way up to her before she finally turned her head around and saw me for the first time. Fortunately, she was not alarmed, but she didn't look very relieved either. I pulled myself closer to her and stuck out my hand for her to sniff. She sniffed it and seemed to accept my peaceful gesture. I touched her back, and, while she flinched at first, she tolerated it and let me pet her. I had hoped to lure her into a carrier, but she still continued to keep her back to me, and there was very little space here for a bulky carrier anyway. So I prepared the cat bag on my arm and then petted her some more with that hand to further solidify our new friendship. 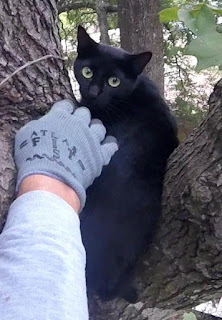 I lifted her out of the tight crotch, and, as expected, she clung to the tree, but I was easily able to pull her legs free. I pulled the bag over her, and, while she complained, she wasn't particularly forceful about it. I secured her in the bag and brought her down. I handed the bag to Kym, and, with great relief, she took Seven inside to release her there. After a few minutes, Kym came back out, returned the bag and reported that Seven looked good and was settling in just fine. I went inside a little later to see Seven, but she didn't want to see that mean, old, scary man who grabbed her in the tree. If she hadn't been so smart and skillful in escaping out of that bag, there's no telling what that mean man would have done. Oh well. Some cats appreciate me, and some don't. Seven doesn't like me, but I like her just the same, and I am happy that she is now back in her supervisory perch next to Kym's desk, and Kym can resume her good works.